On October 20th, we at eLearnSecurity presented a webinar titled: Sneaky Man in the Middle Attack Exposed. We had a lot of people attending with many enthusiastic comments and interesting questions. Thanks to everyone who made it! 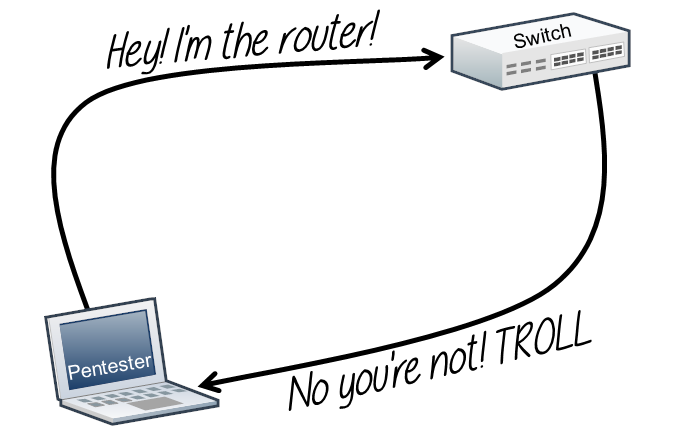 It is possbile to bypass these countermeasures by using a really neat networking feature: the ICMP redirect packets. This family of packets lets a router push to the clients different routes for a certain destination and are usually used to improve network efficiency. Anyway, as some of you are probably thinking, this is not something completely new. Tools like Ettercap can use this technique to mount a half-duplex man-in-the-middle attack. As usual, we penetration tester never settle down, so we want more! I then demonstrated how to use a very common networking technique to upgrade the attack to a full-duplex interception. It gets really fun when you use some everyday concepts in a new and interesting way. It surely has been for me and the people watching the live webinar. You can access the full video and the rest of our technical webinars here – Sneaky Man in the Middle attack Exposed. In the video you will see all the technical details about the attack and the whole approach used to create it. But, what is a webinar without some free goodies for you guys!? Please find the scapy script used to mount the attack at the end of this blog post. Moreover we just released for free a very similar scenario for all our PTP students! If you are one of our students you will find a new lab scenario included in your Hera Lab subscription today. Questions? Ideas? Leave a comment! Thanks for reading and happy hacking. Davide Girardi (GiRa) is a security researcher and instructor. He has 9+ years of experience in system hardening and security consultancy on Linux, Windows, OSX and mixed enterprise environments. not getting the link to view the full presentation. tried different times with different ids.. can you send me the link to watch the video.. I don’t know if I fully understand you. Do you mean that you filled the form and you did not get a link in your email inbox? Good night, you can help me with this error that I get. >>> # Release the Kraken! the code is Python, so indentation matters! As the errors says, you have just to insert some whitespace before the send() method.